If you are starting with raw almonds, roast them on a cookie sheet @ 350 degrees for 10-15 minutes, careful not to let them burn. Cool thoroughly before running through the food processor. In a small bowl, mix all of the wet ingredients together, the maple syrup, oil, and vanilla. Put all of the dry ingredients into the food processor, the roasted almonds*, coconut flour, cinnamon and salt and process until a fine meal is achieved. *Be sure that the almonds are completely cooled before processing; otherwise you will end up with a pasty mess. In a large bowl, sift the flours, the salt and the cinnamon. Add the nuts to this bowl. Pour the wet ingredients into the dry and mix with a spatula until everything is well incorporated. With a one ounce ice cream scoop or two spoons, place batter balls onto a *parchment lined cookie sheets. With a one cup measuring cup, slightly flatten each cookie-This process is a little easier when the cup is dipped into warm water between each cookie. Using a one-teaspoon measure, press the dome side into each cookie, this is where the jam goes. This process is a little easier when the teaspoon is dipped into warm water between each cookie. 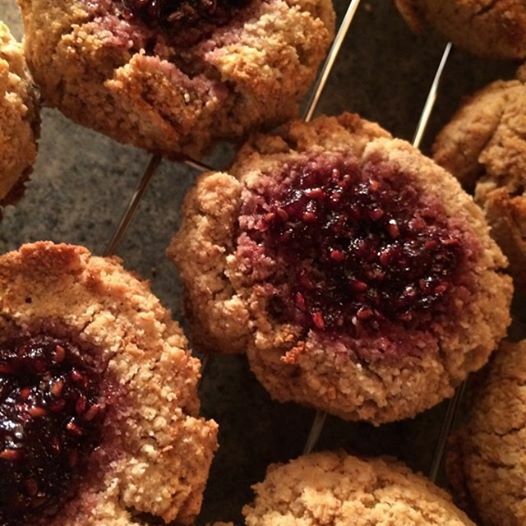 Using a 1/2-teaspoon measure, scoop your choice of jam or fruit preserves into the center of each cookie. Bake for 12 minutes and then rotate the pans in the oven (to insure even baking) and continue to bake for another 5 to 7 minutes. Let cool on the pans for another 5 minutes then remove to a cooling rack. This entry was posted in coconut, cookies, desserts, energy, Gluten Free, grain free, nuts & seeds and tagged antioxidants, comfort food, cookies, dairy free, local love, non dairy, quick vegan protein, save the planet, simple food, slow fast food, THE VEGAN LOVE PROJECT, vegan cookies, whole food love, yoga fuel. Bookmark the permalink.